Warehouse gantry crane can be an ideal substitute to overhead crane for that it is capable of running on the ground instead of traveling on elevated runways. 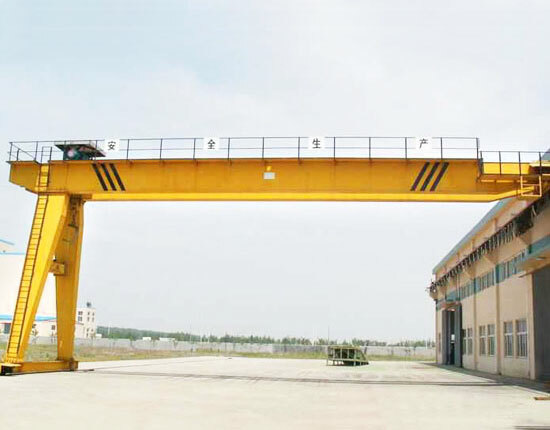 Therefore, the gantry crane for warehouse does not require any construction of supporting columns or overhead runways. The warehouse gantry cranes produced by Ellsen are with solid construction and outstanding performance so that they can increase your production enormously. We supply several main models of overhead gantry crane to serve your varied lifting applications. 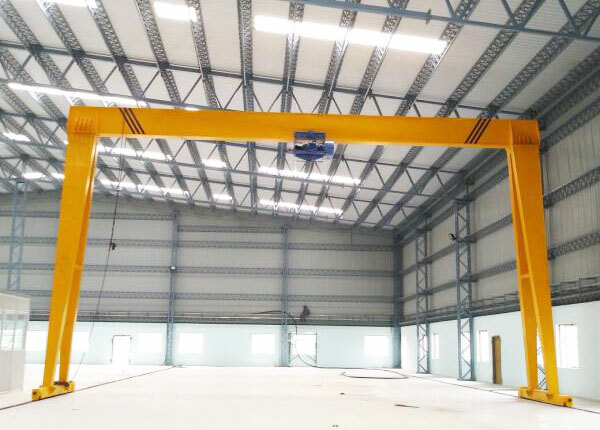 Warehouse gantry crane manufactured by our factory comes in a range of types and models, such as single girder, double girder, semi gantry crane, cantilever gantry crane and mobile gantry crane. Choosing the right type is vital for the production of your warehouse or workshop as a proper gantry lifting equipment can help boost your productivity to the utmost. To understand these different types is very helpful for you in the selection process. MH single girder gantry crane for warehouse is perfect for lifting and moving of lightweight loads with capacity ranging from 3 ton to 16 ton. The single girder warehouse crane can be applied for both of your indoor and outdoor lifting occasions, thus realizing a wide application and high utilization. 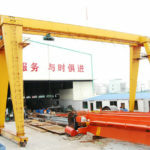 MG double girder gantry crane is capable of lifting a couple of tons to several hundred tons. It can also reach a greater lifting speed and a higher work level in contrast to single girder crane. Besides, this warehouse gantry crane can be configured according to your specific use. 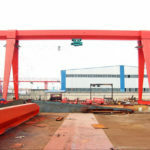 For example, the A frame double girder gantry crane is designed for a general use, whereas U frame gantry crane is especially designed for the lifting of large-sized loads. Semi gantry crane used for your warehouse can be regarded as a combination crane of overhead crane and gantry crane as it is mounted on an elevated runway on one side and a ground rail on the other side. The single leg gantry crane has two main configurations, including single girder and double girder. When it comes to single girder, it usually refers to a small and lightweight lifting capacity. Mobile gantry crane provides high portability and flexibility for your material handling tasks, whether fixed type or not. Mounted on wheels, it can travel anywhere within your working areas and is also easy to operate. The wheel mounted gantry crane can be made of steel or aluminum, and allows for custom design to meet your special needs. To fit your varied lifting occasions, we supply an array of other types of gantry lifting systems, such as workshop gantry crane, workstation gantry crane, shop gantry crane and garage gantry crane. When looking for a warehouse gantry crane, you need to make a prudent decision for that it is not a small item you buy every day. 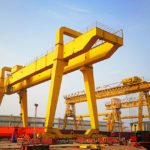 A quality gantry crane will cost you a great deal of money. As a professional gantry crane supplier, we can offer you a strong and affordable lifting solution. If you are interested, contact us now! How to Operate Warehouse Gantry Crane Properly And Safely? 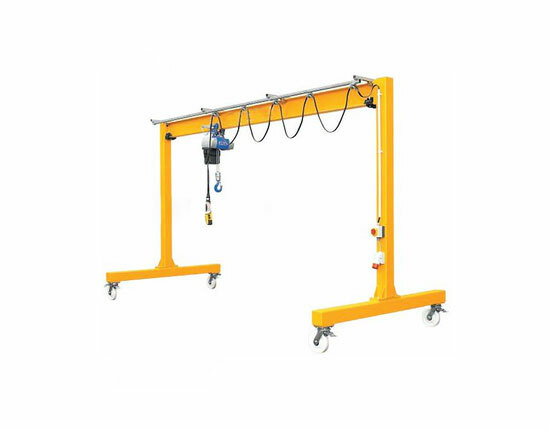 Gantry crane is generally operated within a cab room or remotely from the ground which consists of pendant control and wireless remote control. 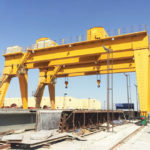 Before purchasing the equipment, you can discuss this issue with gantry crane manufacturer and supplier so as to determine the best operation method. The way to operate the crane is highly dependent upon the type of load, working environment and ease of use. For the vast majority of bridge gantry cranes, they can be powered by cable reel, diesel generator set or bare copper wire. With regard to portable gantry crane, it cannot be powered by electricity because it is mobile. In order to ensure a safe operation, the crane control system is normally equipped with emergency stop button and some other protection devices. It is also important for gantry crane operator to choose a safe area in the operation process so as to get rid of any potential accident. In addition, a safety inspection should be conducted periodically. Cost effective: it is an economical solution for most of indoor and outdoor lifting occasions and also a good alternative to overhead crane. 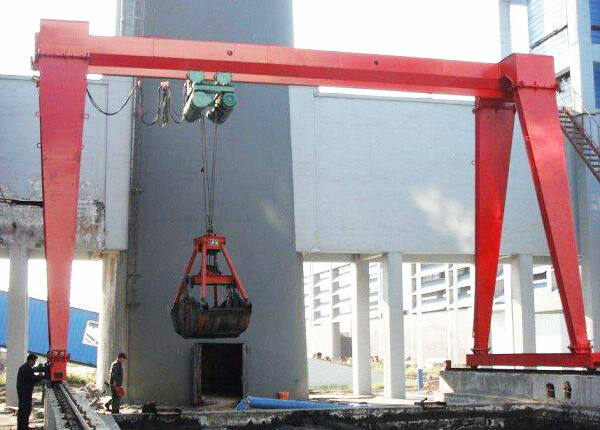 Strong mobility: compare with other types of lifting equipment, gantry crane can be mobile so that it can move from one place to another easily as well as realize a convenient relocation. High adaptability: these electric gantry cranes are suitable for varied lifting applications in your factory including manufacturing, repairing and assembly lines. Large capacity: it has the ability to handle a range of materials weighing from several tons to dozens of tons. Excellent safety: combining the use of proper operation method and sturdy construction, the warehouse gantry crane provided by our company will realize a safe lifting operation, which will not only ensure the staff safety, but maintain an efficient production. 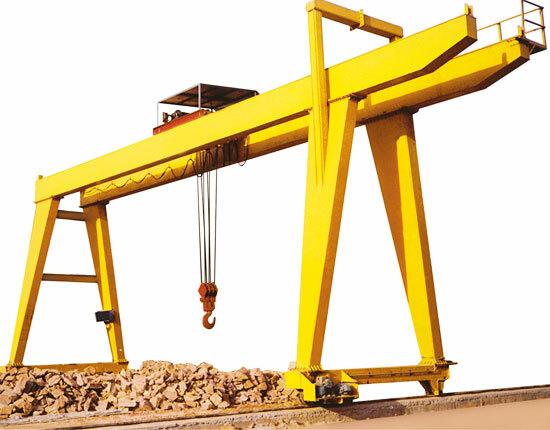 Reliable and durable performance: our gantry cranes are with high reliability and durability. They have smooth movements as well decreased crane downtime. Besides, they require minimal maintenance work. The equipment also generates little noise during the movement. Gantry Crane vs. 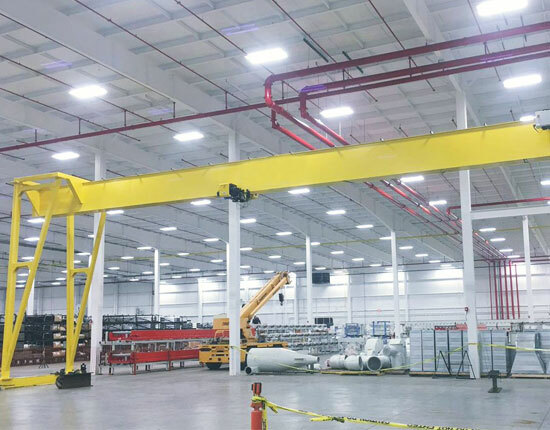 Overhead Crane, Which Is Best For Your Warehouse? Both gantry crane and overhead crane can remarkably improve efficiency and productivity of your warehouse. The question is, which type is best for your needs? To know the answer, you should first have a basic knowledge of similarities and differences of these different types. Overhead crane, also known as bridge crane, mainly consists of main beam, end main, hoist trolley and electric control system. It is characterized uniquely by an elevated runway beam on which the crane is mounted. The bridge crane is generally applied in various indoor facilities, and in order to fit different facilities, the overhead crane can be configured into top running and underhung crane. Gantry crane is generally the same with overhead crane except that it is supported by legs. Instead of running along overhead runway, it can travel along rails mounted on the ground or run on wheels, allowing for the ease of movement and transportation. 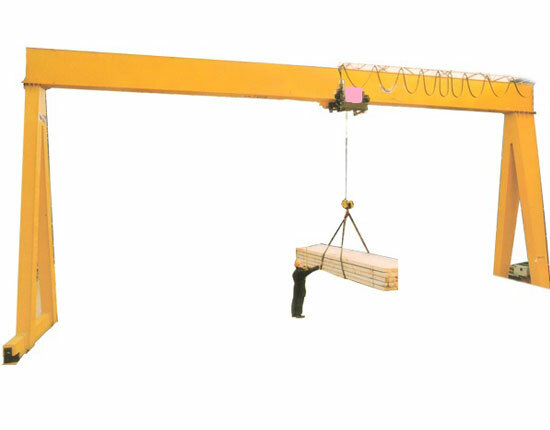 The gantry crane is suitable for both indoor and outdoor working occasions. Each type of lifting equipment has its own advantages and disadvantages, so you should choose the most appropriate one to maximize your benefits. According to your specific lifting requirements, facility conditions, convenience of use and of course your budget, you can select the best type for your warehouse. If you have any doubt on warehouse gantry crane, welcome to call us or contact us online. We are very pleased to answer your questions and solve problems you have.